The growing costs and complexity of traditional IT environments is leaving IT leaders at a crossroads. Public cloud promises greater agility and speed, but diving headfirst into the cloud isn’t a plausible solution for every workload – and especially business-critical ones. 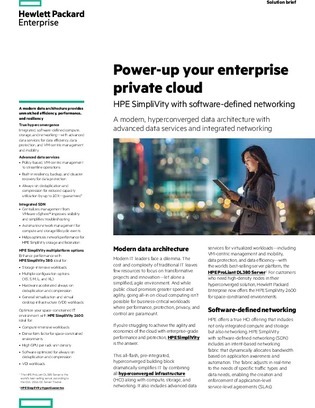 Inside this quick white paper, learn how the HPE SimpliVity platform can help enterprises meet in the middle, rolling all-flash, hyperconverged, software-defined and other modern technology options into a pre-integrated bundle.